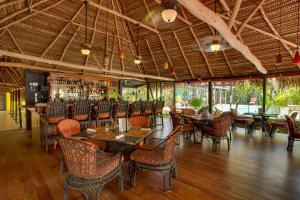 ﻿ Best Price on Coco Plum All Inclusive Resort in Dangriga + Reviews! Set in Dangriga in the Stann Creek Region, Coco Plum Island Resort features a sun terrace and views of the sea. Guests can enjoy the on-site bar. The unique private island features a limited number of comfortably appointed ocean-front cabanas where you can rest after an exciting day of adventure tours. Certain rooms include a seating area to relax in after a busy day. For your comfort, you will find free toiletries and a hair dryer. There is room service at the property. 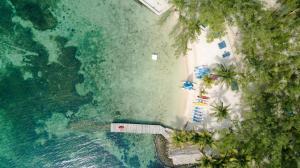 Guests can enjoy various activities in the surroundings, including snorkeling, diving and fishing. The nearest airport is Dandriga Airport. Property offers tour packages depending on the length of your stay. - 4 night stays include three tours (two - snorkeling trips along Belize’s Barrier Reef and one inland tour) - 5 night stays include four tours (three- snorkeling trips along Belize’s Barrier Reef and one inland tour) - 6, 7, 8, and 9 night stays include five tours (three snorkeling trips along Belize Barrier Reef and two inland tours) - 10 night stays include seven tours (five snorkeling trips along Belize Barrier Reef and two inland tours). You can choose from the following inland tours: Mayan Ruins of Xunantunich (Fridays, weather permitting) Zip-line above the Belize rainforest and cave tube down our rivers or visit the Belize Zoo (Tuesdays, weather permitting) We offer courtesy transportation to and from Dangriga and Coco Plum Resort for your arrival and departure and free use of kayaks.